Are the products on your website in stock? Yes! All of our items on our website are in stock and ready to ship. We are constantely updating the stock amounts on our website in real-time. All prices and quantities are subject to change at any moment. So if you see an item that you are interested in, you will want to place your order immediately. Because quantities and prices do and will change. Worldwide orders are coming in 24 hours a day and our inventory turns over very quickly! You can reach us via our contact page, by email or by phone. Service and support requests are typically answered during our normal business hours, 8am to 6pm EST. We try to respond to all requests by the next business day but sometimes it may take up to 72 hours based on the volume of requests in the queue. We want happy customers. If you’re happy, were happy! Online return requests are easy, simply login to your account and complete your request with just a few simple steps. Non-Defective items may be returned within 10 days from the date of purchase unless otherwise stated on the product's details page. Customer is responsible for all associated return shipping charges. The following conditions apply. Unopened-factory sealed items are subject to a restocking fee up to 20%. Open items (factory seal is broken or tampered with) are also subject to a restocking fee up to 20%. We encourage you to do some research before you make your purchase. Google it, Bing it or use your favorite search engine and check out the manufacturer’s website for more details related to the product you would like to purchase. May be returned up to 7 days from the date of purchase unless otherwise stated on the product's details page. The following conditions apply. Contact the manufacturer directly to verify the product is defective. Often times the product is not defective and the issue can be remedied by the manufacturer’s service department. If the item is defective, please ask for the manufacturer to provide you with a confirmation reference number related to the call. Refurbished products on our site come with a 60-day limited warranty from the manufacturer or the manufacturers authorized service center. New products on our site typically include a 1 year limited warranty direct from the manufacturer. Exchanges and/or repairs are handled solely by the manufacturer. A call or email to their support team usually proves expeditious in solving the issue, getting a replacement or sometimes, even an upgrade. As previously stated, exchanges or repairs for this item are handled by the manufacturer. If you wish to exchange the product, please contact the manufacturer. Do not return product until you have been issued an RMA number. Any unauthorized return will be refused or shipped back to the customer. For your protection, we recommend that you use a traceable carrier that can provide you with a tracking number and delivery confirmation. Shipping and handling charges, both to and from our warehouse will be paid by the customer, and are non-refundable. At our discretion, Partschase.com will issue a prepaid shipping label or reimburse customer for shipping charges related to defective products. We offer extended service plans on select items throughout our store, available for purchase at the time of sell. We provide these services for a nominal fee. How long does it take for a refund to show on my account? Refunds generally processed 2-3 business days, but may take up to 5 business days. Submitting a valid order is very important. We know you want your item quickly. When you’re happy, we are too! We need sufficient information to verify your identity and may need additional time or need to contact you for more information. As much as we would like to ship your order immediately, we cannot ship your product until we verify your identity. Currently we ship to the Contiguous United States but plan to ship to more international locations as soon as possible. Contiguous United States excludes the states of Alaska and Hawaii, and all off-shore U.S. territories and possessions, such as Puerto Rico. 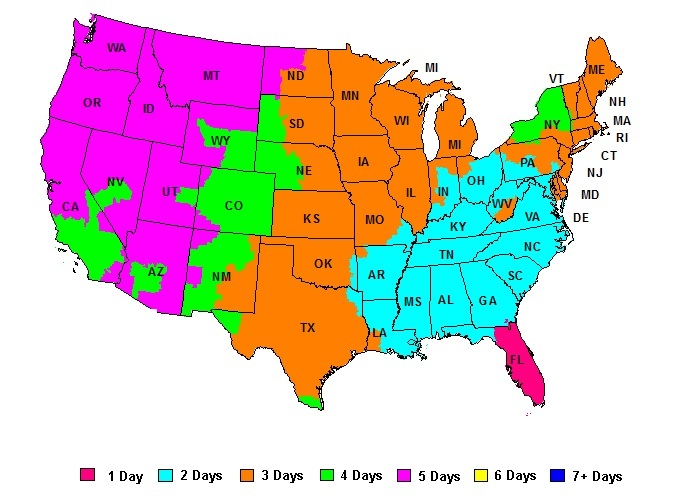 This map illustrates service schedules in business days as of November, 2013 for FedEx Ground shipments. - Orders weighing less than 20 lbs. - Offer not valid on return shipments, special orders, prior purchases. - Offer is limited to stock on hand, is nontransferable and is not redeemable for cash. - Offer is limited to standard shipping in U.S. lower 48 contiguous states only. - Oversized shipping charges will be applied to any heavy or large items in your order. - We will notify you in advance of completing your order. We reserve the right to modify or change the terms of our free shipping promotion at anytime and without notice.